Somersby Cider wobbling on the shoulders of a giant? The Somersby Cider advert is funny, and quietly remarkable. For it relies on a knowledge of Apple stores, and the Apple brand. It is no coincidence that Apple’s fanboys and fangirls are stuck to the flypaper of creative departments everywhere. It subverts the seriousness of Apple stores, replacing customers with drinkers examining pints of cider with intensity and fascination. At a stroke it makes other cider marketing appear creakily old-skool. Yes. It is getting Somersby talked about, and making people laugh. Then yes it is as great result. What we are doing is combining a streak of comedy – and this was one of the few ads that actually made me guffaw when I saw it – with Postmodern Irony. This is an advert that is busy nudging us in the ribs, and making us co-conspirators in the knowledge that we are watching an advert. The danger in combining comedy with postmodern irony is that you can disappear up your own marketing fundament. 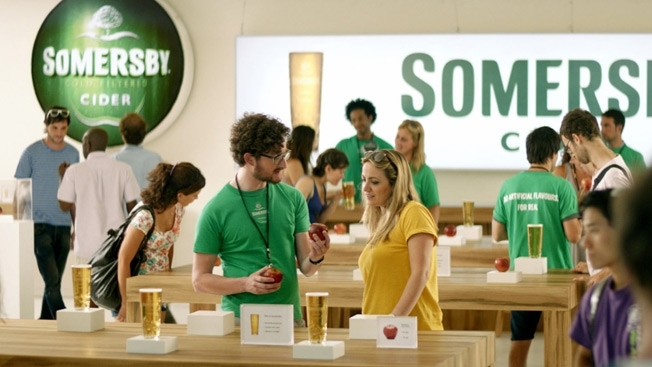 For the Somersby ad is as much about advertising as medium, than it is an advert for cider. The ultimate winner from this marketing spend is Apple. Hitching a ride on a global brand is an interesting strategy, but not without danger. I watch Somersby’s progress with interest. This entry was posted in Comedy, Drinks Industry, IT, Postmodern Irony, TV advertising and tagged advertising, Apple, Marketing, Somersby Cider. Bookmark the permalink.